Limited-time new release pricing of 0.99! How far will a wayward Ranger go to save his only son? Fadis the Ranger once served an evil king. Then he rebelled, ran, and lost everything he fought for in fire and blood... except his son. Hiding him with the elves he believed he could eventually return to be what he never was but he didn't expect the world he'd return to. When a chance encounter with a deadly rogue, her father, and a sickened dwarf that no magic can heal further spur Fadis towards the safety of elven lands, they find the way shut. Darkness is upon the woodland realm. Soon the Ranger is separted from his other companions, discovering a disastrous plot that threatens the Western lands and his lost son's home. Elves, dwarves, and men are about to clash in a bloody war but it is from the twilight realm of shadows that their true enemy awakens. Fadis must gain the trust of the very elves who may be the only ones able to stop this tragedy... but will his son even care he has returned after so long? 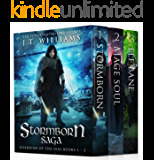 Grab this boxset special edition of the Ranger's Revenge ebooks and get ready for an explosive ride of archery, magic, assassins, and the harrowing battles of the Stormborn Saga world! 5.0 out of 5 starsBox set! What a way to read this fantastic story nonstop!! 5.0 out of 5 starsOpen up a can of awesomeness! Three epic books. Three times the awesomeness. Valrin is back in Ranger's Fury!! Been waiting for this one for a while since I loved Valrin and his crew in the earlier Stormborn novellas! JT Williams has such a rich world, with multiple races and beings--old and new. You never know what he's going to come up with next! Just like all his other books, Ranger's Fury is adventure after adventure! I love the introduction of the Purified Ones! The battles, the magic, the looming threat of the coming darkness . . . bah!!! And the way it ends, leaving you wanting more! JT Williams keeps pumping out awesomeness in Black Moon, and I'm having a hard time choosing a favorite!! I really love the Halfblood series and its amazing adventures, but this one.... this one gave me an almost Mistborn/Six of Crows feel!! The action and battle scenes are magnificently done! The battle scenes actually take up a good portion of the book--a huge BONUS for me!!! There were some scenes that had me laughing out loud in the break room! He really kicks it into high gear with Black Moon! Aieiclo reminded me of the third book in the War of the Ancients trilogy (Warcraft), the same earth-shattering brilliance! The lore surrounding Aieclo and Aeveam's character--her torn fate and absolutely raw power--is magnificently done! What an end to the trilogy!!! An epic, cataclysmic whirlwind of adventure! 5.0 out of 5 starsCouldn’t Ask For A Better Boxset! I hate finishing a book and then having to wait for the next book to be released in order to continue the story. J.T. Williams has created a series that you will not want to and/or be able to put down. 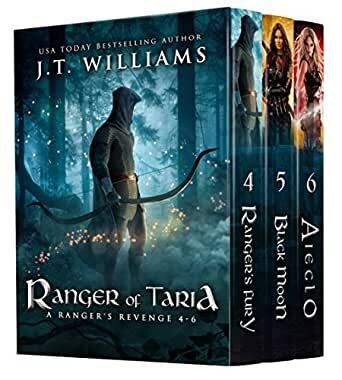 With the Ranger of Taria: A Ranger’s Revenge Boxset you don’t have to worry or wait for the next book to continue the story. Follow Fadis on a journey that will pull you in to a story that truly leaves you wanting to know what happens next. I highly reccommend this boxset to everyone. 5.0 out of 5 starsThis is Fantasy at it's Best! JT does it again with this boxset of the Ranger Trilogy. The world he has built is full of magic and adventure, with challenges for his characters to overcome. This is Epic Fantasy at its best, I recommend it to everyone who enjoys it.